"You can tell how high a society is by how much of its garbage is recycled." 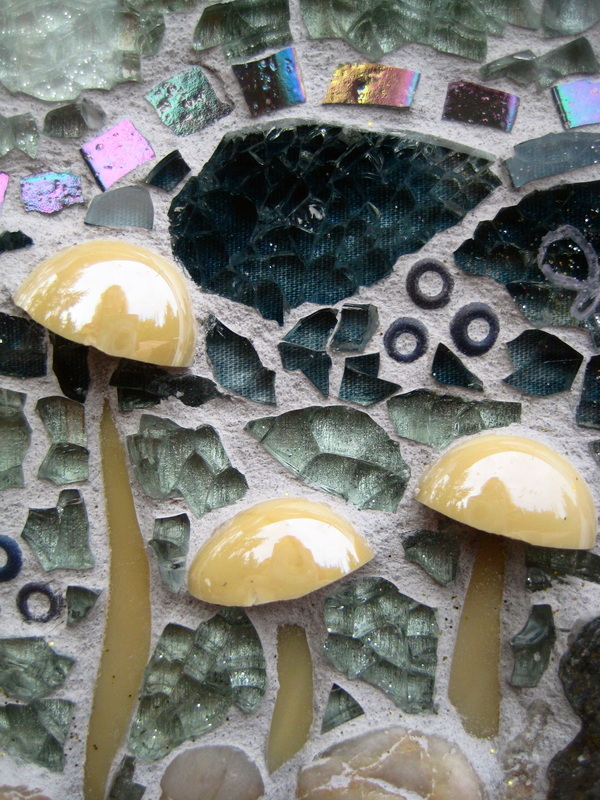 What was once destined as trash in our mountainous landfills becomes reincarnated as a prominent piece in my contemporary mosaics and bricolages. 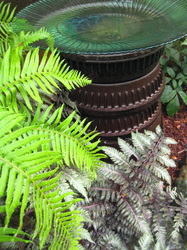 As an artist, I find myself working more and more with recycled and reclaimed materials. This present time in our world it is important to find uses for what is readily around us. Artists are in a fantastic position to forge ahead with creative ideas for using what is available in our surrounding environment. 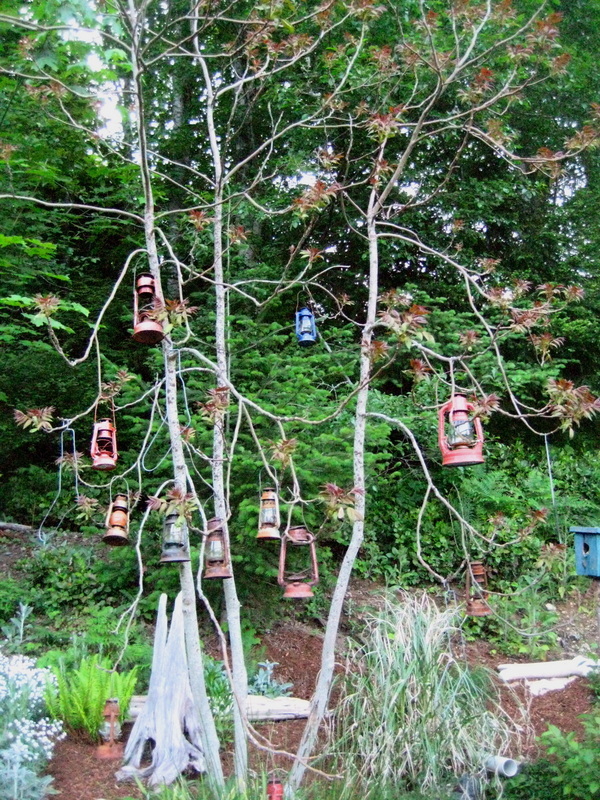 Using collected materials, unwanted items and what many consider to be “waste” is an earth-friendly, green approach to art making. The supplies are endless, we are surrounded by appropriate materials which can be ‘born again’ in a new life within a piece of fine art. 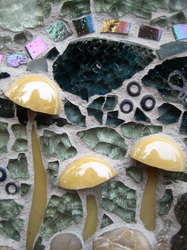 This is what truly excites me as a mosaic artist to share my enthusiasm for incorporating reclaimed/everyday materials which are then passed on to those that view the art. 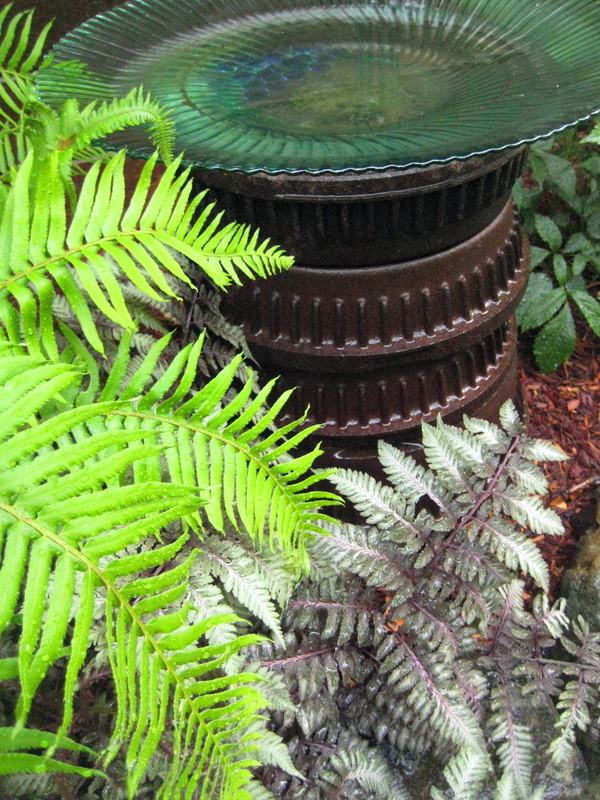 Art created from recycled cast offs can expand from the interior of our homes to our gardens, farm, place of business and even on balconies. Old ceiling globes flipped upside down suddenly becomes a mushroom cap screwed on to a driftwood stem and placed along a path or in the garden. 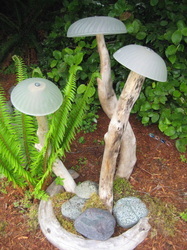 Add a solar up light and you have a magical mushroom which glows at night. How about fishing flashers in the cedar trees? Yet another recycled purpose for liked objects to add a statement, swirling flashes of light, movement and play in your environment. 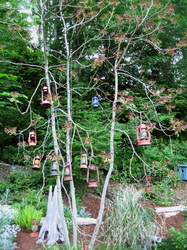 My family’s collection of old colourful oil lamps are now hung on our sumac tree which looks so cool and funky in all of the seasons. The trick is to look at an intended object with new eyes and use it in the least expected way. I prefer to use ‘earthier’ materials; metals, stone, glass and wood so tend to avoid most plastics. I find this man-made material has no energy and difficult to use with mortar and cement within my mosaics or garden sculptures.